Tristi Pinkston is a freelance editor, media reviewer, online writing instructor, and a popular presenter at the annual LDStorymakers Writers Conference. She's also the author of six, soon to be seven, published novels, and the mother of the world's four most talented, creative, and intelligent children. Tristi: My whole entire life. I actually can't remember a time when I didn't want to write. Tristi: I first started writing when I was five years old. Of course, it took a while for anything I wrote to actually be salable. I was homeschooled all through my life, and took some English courses through BYU Independent Study. I also took a freelance journalism course through correspondence. Tristi: That's kind of a tough question. It's so much a part of me that thinking about it seems unnatural. Um, I love doing it. It makes me feel fulfilled. I go a little nuts when I don't do it (probably why my husband encourages it so much) I love getting my stories down on paper, stepping into those alternate realities, and seeing what my characters are up to that day. Of course, you, Deirdra, have found ways to make your everyday life a little more like your alternate reality, which is awesome. Tristi: I first submitted it to a major LDS publisher, who had it for a while and suggested some rewriting. I did that, and then sent it back in. It was ultimately rejected. Then I sent it to another company, who wanted it, but also wanted me to pay for the printing. I didn't know that was part of how they rolled, and I was really upset and a little bit furious, too. I went to bed and cried for two hours. Then I got up, went to an all-night Kinko's, printed off six more copies, and did a mass submission. It was getting out of bed that led me to finding Granite, my first publisher. The lesson here - it's okay to cry for a little while. It's what you do next that makes all the difference. Tristi: Yes, indeed! Lots of times! And I'd have to rethink this whole thing - do I really want to write? How badly do I want this? Every time, the answer was, "I want this and I'm not giving up." You've got to make that decision for yourself. What are the things you most want, and what are you willing to do to get them? I'm not willing to work hard to become an acrobat - that's not a dream I've ever had. But I've always dreamed of being an author, and so I knew I had to keep pushing on until I got it. Tristi: I most often write at night. My kids go to bed, the house is quiet, and then it's Tristi time. If I have a story that's just flowing, I'll sometimes sneak it in here and there throughout the day, but night time is my time. I'll knock off between 1,500 and 3,000 words a night, about four days a week. Tristi: They sort of attack me out of nowhere and then refuse to leave me alone. When they won't go away, that's when I know I should write about them. Deirdra: Can you tell us a little about Secret Sisters and why this appeals to so many different women? Tristi: Secret Sisters is just fun. My main characters are three elderly women who comprise the presidency of a Relief Society in a fictional Utah town. They get into some scrapes and end up solving a mystery. The book is a gentle spoof of Mormon culture, only done with respect. You'll recognize yourself or ladies you know in the characters, you'll feel as though Ida Mae should be your grandmother, and you come away feeling uplifted. The story is completely appropriate - my nine-year-old has been reading it and my twelve-year-old son is my biggest fan - but it's not complete fluff. I do insert some serious subplots as well as the humor. But then we're back to the spoof. Tristi: First of all, I want them to have something clean, entertaining, and uplifting to read. It's hard to find books like that today. I also hope they'll identify with the characters, feel as though they've made new friends, and ultimately I hope they come away from the experience feeling as though they've done something good with their time. Tristi: Most of the time, I just sit down and write. I like to see where the characters take me. This has been more true of Secret Sisters than anything else I've ever written. These characters have minds of their own and I have to listen to them. If things start to get a little jumbled, I'll do some outlining so I don't get lost. If I'm writing a historical fiction, I'll keep a timeline so I know I'm not missing any key historical events that should be included. But I can't stick to a really rigid outline or I feel confined. Tristi: Most of the time, I just walk away from the computer and do something else. It'll come back after I've rested. Other times, I'll describe the problem to my husband. Saying it out loud generally unstops the clog. I've also found my critique group to be invaluable. Sometimes they'll provide the answer, or they'll say something that spins off into the answer. Tristi: I do not listen to music while I'm writing. I like music with lyrics, and I can't listen without singing along. It's impossible for me to write and sing at the same time, so, therefore, I do not listen to music. However, as the mom of four kids, I don't need absolute quiet. I would prefer it, but if I waited for it, I would never have published anything. Tristi: It really all depends. If I'm writing a historical, I immerse myself in that time period. I watch movies and read books from that era - I drench myself in them. Then when I sit down to write, I can imbue that flavor into what I'm writing. If I'm doing a contemporary, it's a little different. I just rely on the voices in my head. The voices are my friends. Mostly. Unless they're telling me to eat too much chocolate. Then I must ignore the voices. Tristi: That's a hard question. Without doubt, my parents have been hugely inspirational. They've always cheered me on in whatever I've wanted to do. I never heard, "Oh, you can't do that." (Well, my mom encouraged me not to sing. But we don't need to go there.) My husband has been so supportive. My kids are awesome. They've never known me not to write, so this is all just part of life for them, but they are my biggest fans. I have a ton of writer friends who buoy me up every day. Tristi: Listening to them and doing what they want. If you start trying to make a character conform to your will, they become flat and uninteresting. When you give them their head, they will leap off the page and into the reader's heads and hearts. Tristi: Definitely ice water. Definitely. In fact, I can't work without it. I also like sunflower seeds. If I'm going for something sweet, I like gummy peach rings. And of course, chocolate. I always tend to head for things I can eat one-handed so I can keep typing with the other. Tristi: You've got to keep at it. Don't just write something, say it's good enough, submit it, get rejected, and then give up. You have to make a commitment that you never will settle for good enough, and that you'll self-edit until it's as good as you can possibly make it. And then don't settle for rejection. Decide what your dream is worth to you and the price you're willing to pay to get it, and then don't give up until you've paid that price. Tristi: The second book in the Secret Sisters Mysteries series, "Dearly Departed," has just been picked up by Walnut Springs Press, and it's coming out around the first of the year. I've written the other books in the series (there are five) and I'm putting the finishing touches on the fifth book. I've also got ideas for several other cozy mysteries as well as other historicals, and I'm currently writing my first YA. I like to try lots of different things. Tristi: Amazon.com is the best place to find my first three - in fact, the only place. 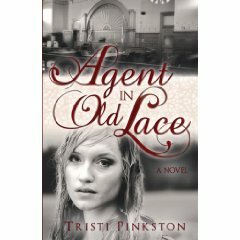 All my books are available there, but you can find Agent in Old Lace and Secret Sisters at Deseret Book and independent bookstores. Secret Sisters is also available at select Seagull locations as well as Walmarts in Utah. Tristi: Let's see ... um, how about, buy my books, tell all your friends about me, and send me chocolate cookies. Does that work? Deirdra: *LOL* You are so awesome, Tristi. Just so my readers are aware, Tristi is giving away prizes during the month of December. Check out her blog at http://www.tristipinkston.blogspot.com . Tristi: Thanks for hosting me, Deirdra! It's been a lot of fun! I'm very glad I didn't give up ... and you shouldn't either, Maggie! It's not too late. It's never too late! Thanks for the encouragement. This is a great way of continuing on and still believing in oneself. What a great interview. Thanks for sharing your story. It gives all writers hope. I took a minute to get here, but I'm here. You left a comment on my blog almost a month ago and as I have been neglecting my blog due to homework and exams, I am just now getting around to visiting people. You have a beautiful blog here and such inspiration available. I'm so glad you came by my place. or I may have never found you. Pleasant interview! Secret Sisters looks fab! I love Tristi, both as a friend and writer! Great interview!